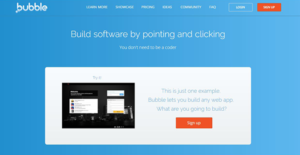 Bubble is a robust visual programming and web development framework tool for non-tech savvy people. It’s a general-purpose rapid application development software that lets users develop production-ready mobile and web applications without coding; no tedious HTML or CSS programming. The solution empowers users to build and customize applications via a user-friendly interface using the drag and drop technique. It makes coding obsolete and puts the power to create innovative applications in the hands of everyone. The platform adopts workflow-based programming allowing users to define what happens, step by step. It lets users incorporate specific logic to make workflows run under unique conditions and modify the elements’ look based on where the application user is. Bubble integrates seamlessly with services that display a REST API such as SQL, Facebook, analytics and payments applications. Bubble is a robust visual programming platform that enables users to create innovative web applications, hassle-free. It’s an easy-to-use software that is expertly crafted for users without prior programming experience. The solution makes it easy to build and customize workflows and databases entirely visually. Its drag and drop builder makes it super simple to add page elements such as photos, text, input forms, and maps. The builder permits users to build their interfaces to the pixel to come up with unique apps. Publishing the apps built on Bubble apps is dead simple with one click. All the apps feature a backend and are built to integrate with services through an API. Bubble hosts all the apps behind the scenes thus eliminating the time-consuming tasks of scaling and maintain them. The version control tool allows users to securely scrutinize all changes on a private version before deploying them to users with a single click. Also, going back to the previous version is also a breeze with the version control module. Bubble takes care of the lower level tasks thereby giving users ample time to focus on app’s functionality and design. This leads to the development of highly-responsive apps which look great on tablets and mobile. In addition, the apps exhibit inimitable conditionality thanks to the robust logic. The color, font, and the visibility of each element adjust promptly based on what’s happening in the applications. Another impressive attribute is that Bubbles apps deliver real-time data actions. This means the app user will not have to refresh the page; updates are delivered instantly. If you are interested in Bubble it could also be sensible to investigate other subcategories of Best Rapid Application Development Software - RAD gathered in our database of SaaS software reviews. Enterprises have different wants and requirements and no software application can be perfect in such a situation. It is futile to try to find an ideal out-of-the-box software product that meets all your business wants. The intelligent thing to do would be to adapt the solution for your unique requirements, worker skill levels, budget, and other factors. For these reasons, do not rush and invest in well-publicized trendy systems. Though these may be widely used, they may not be the best fit for your specific wants. Do your groundwork, check out each short-listed application in detail, read a few Bubble reviews, contact the seller for explanations, and finally settle for the app that presents what you want. We realize that when you make a decision to buy Rapid Application Development Software - RAD it’s important not only to see how experts evaluate it in their reviews, but also to find out if the real people and companies that buy it are actually satisfied with the product. That’s why we’ve created our behavior-based Customer Satisfaction Algorithm™ that gathers customer reviews, comments and Bubble reviews across a wide range of social media sites. The data is then presented in an easy to digest form showing how many people had positive and negative experience with Bubble. With that information at hand you should be equipped to make an informed buying decision that you won’t regret. What are Bubble pricing details? What integrations are available for Bubble? If you need more information about Bubble or you simply have a question let us know what you need and we’ll forward your request directly to the vendor.